The mirror substrate is made of pure Si and the surface is coated with two metal stripes, Pt and Rh, with 4 mm bare Si stripe in the middle. The mirrors are tapered and mounted on a tapered-mirror-bender system [1, 2]. The mirrors and the bender system are contained in a He-flowing chamber, of which the downstream face is shielded by lead-plate and the side windows are made of lead-included acryl. For normal operation, the Pt stripe (right side when look down the narrow tapered end) is used at 1.8 mrad angle, ~45 keV cut-off energy. With the useable length of mirror, 280 mm, the effective beam cross-section is 0.5 mm. The focused beam profile is measured by scanning a tungsten edge blade or a rod. 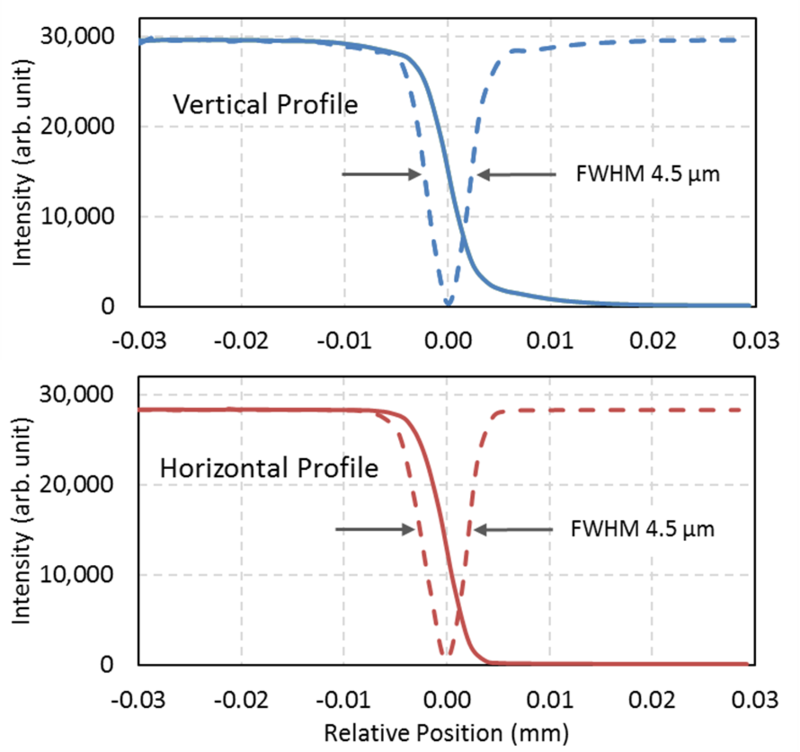 Both vertical and horizontal beam has less than 5 µm at their FWHMs conservatively, while the finest FWHM is 3.0 µm. The full tail size defined at <1% of peak intensity extends to ~30 µm for the vertical and ~ 20 µm for horizontal profile, respectively. Finer tail sizes can be obtained at the cost of incident beam cross section hence the flux. The following plots show the typical beam profiles at E = 30 keV. 1. Yang, B.X., et al., Geocars Microfocusing Kirkpatrick-Baez Mirror Bender Development. Review of Scientific Instruments, 1995. 66(2): p. 2278-2280. 2. Eng, P.J., et al., Dynamically figured Kirkpatrick Baez x-ray microfocusing optics. Proc. SPIE, 1998. 3449: p. 145-156.